Since I’m at a new job and all, I didn’t know how lunch time would go, so I photographed my lunch before I left for work this morning. I had a half sandwich, a side salad, and an orange. 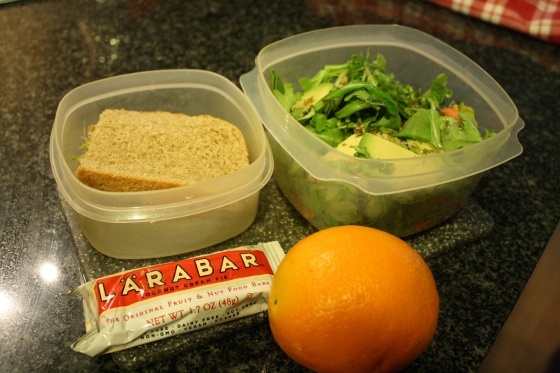 I also packed up a coconut cream pie Larabar for a snack. Did I mention that I sprouted my wheatberries myself?! I buy sprouts all the time because they are super healthy. 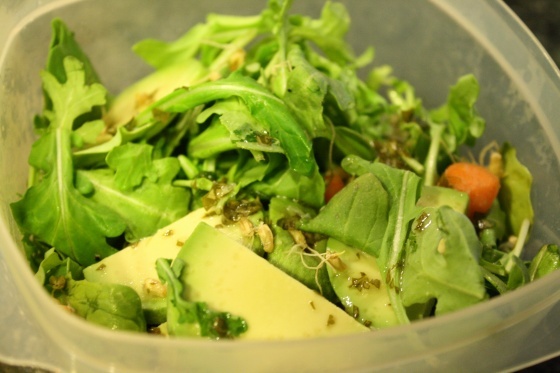 Did you know that when beans or grains are sprouted, their nutrients actually increase? Sprouts are full of enzymes as well as tons of vitamins. Plus they add a nice crunch to a salad. 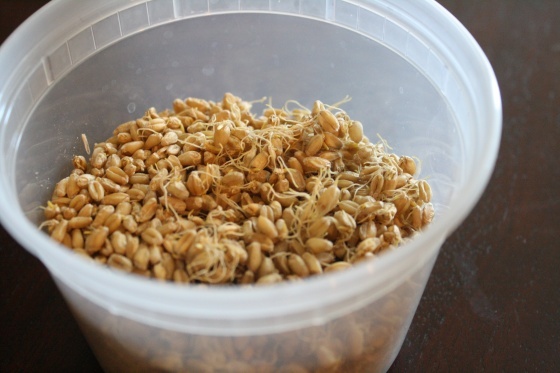 Sprouting my wheatberries was easy! I simply put uncooked wheatberries in a glass jar, filled the jar with water, and then covered it with a paper towel, which I secured with a rubber band. I put the jar in a dark cabinet and twenty-four hours later, I rinsed and drained the wheatberries and put them in a glass bowl (for optimal sunlight exposure), then placed them in direct sunlight. Even though it was rainy and overcast for two out of the three days my wheatberries sat in the window, my sprouts were still a success. On day three, I turned over the wheatberries with my hand and found that all of the sprouts were growing down, which is why I didn’t notice them at first. 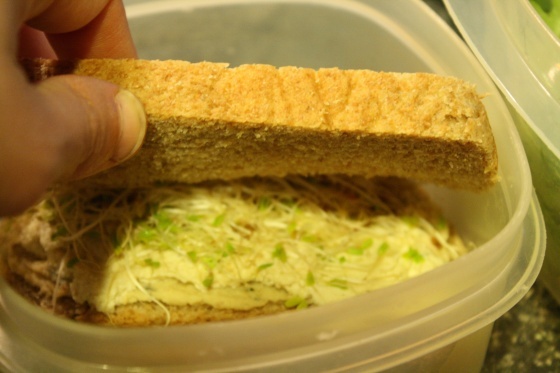 I got a double serving of sprouts by adding some to my sandwich, as well. 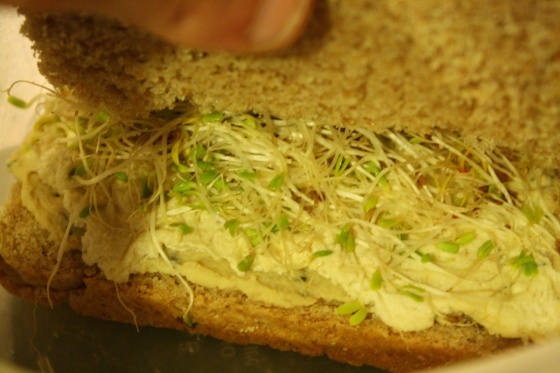 I topped Great Harvest Honey Wheat Bread with rosemary hummus, cashew cheese, and alfalfa sprouts. Oh goodness. Ryan LOVES excel. He is actually the “go-to” guy for Excel at his workplace. People from the LA and NYC offices even call him up for help. He’s hosted classes for them even with the online projector in their boardroom. Pretty hilarious.